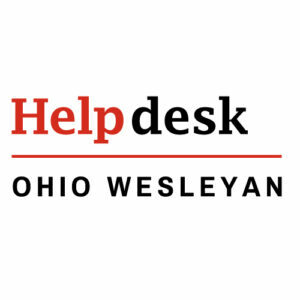 Find answers to your computer hardware related questions and questions about hardware at OWU. A DVD-RW (DVD-recordable and -rewritable) optical drive, built-in or external. Note that these are recommendations only. Students may do just fine if they have equipment that is below these specs. Many students also bring other mobile devices such as smart phones, iPods, or tablets to campus and connect to our wireless network with them. See the additional question on this page for desktop computer recommendations. Note that these are recommendations only. Students may do just fine if they have equipment that is below these specs. Many students also bring mobile devices such as laptops, smart phones, iPods, or tablets to campus and connect to our wireless network with them. See the other question on this page for recommended laptop info. For both PC and Mac, you may visit the GovConnection website and use your OWU email address to sign in. Click here for a list of nearby computer businesses who can help you with your personal computer. OWU Information Services repairs only University-owned machines. 1. Just open this link in Internet Explorer: http://www.crucial.com/ and click on the SCAN MY SYSTEM button on the right. 2. Then click in the checkbox under Crucial System Scanner Tool and click on the DOWNLOAD THE SCANNER button. 3. When you get the File Download – Security Warning, click Run. 4. When you get an Internet Explorer – Security Warning, click Run. 6. The Crucial web page will change to your scan results, showing you the currently installed memory, the maximum memory capacity, how many slots you have, and more information. 7. Under the All Compatible Parts header and on the right will be Crucial’s recommendations for an upgrade, complete with how much memory and how much it will cost. Crucial typically has good pricing, and you could copy and paste their recommendation into an e-mail to Purchasing. We would install it for you once it’s received. You can try these methods before considering a replacement. If you’d like to clean your computer screen and you’re looking for a safe cleaning solution that won’t harm your monitor, the best solution for cleaning LCD screens is a 50/50 mix of distilled water and white vinegar, or 72% isopropyl alcohol. There should be a tag on the back of the machine (desktop units) that gives a warranty date or manufacture date. If it is a manufacture date it will be warranted 5 years from the date. If it is a warranty date it will be that date that it runs out of warranty. UPS (Uninterruptable Power Supply) batteries must be ordered through Purchasing. Once you have received the replacement, call the Help Desk to schedule installation. Purchasing will know what battery to order from the make and model number, found on the front label of the UPS. The maximum size is 400 watts.